This class seeds itself using an operating system provided RNG. AutoSeededRandomPool was suggested by Leonard Janke. Definition at line 155 of file osrng.h. 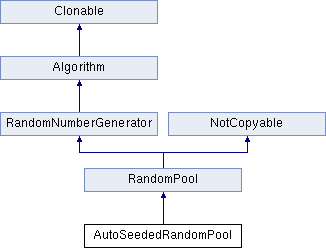 Use blocking to choose seeding with BlockingRng or NonblockingRng. The parameter is ignored if only one of these is available. Definition at line 167 of file osrng.h. Definition at line 259 of file osrng.cpp.